Disclaimer: I do not want to sound like certain seniors but SOME things used to be better in the “olden days” as my daughter puts it, bodybuilding being one of them. 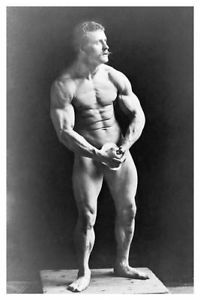 Today we shall learn about another great German coach and bodybuilder. Eugen Sandow. He is was the first trainer to the stars, his physique is the base of the Mr Olympia state and I wager he looks better than 90+% of all gym goers at my gym, even though he lived before the invention of steroids (pardon the weird outfit but he did not have Instagram to give him feedback). Here is a very short biography: born in what is today Kaliningrad in Russia back then Koenigsberg. He was quite athletic and joined a circus as well a wrestling team where he was introduced to dumbbells and barbells. He started building his body, while touring Europe wrestling humans, bears and lions. He then become a famous coach in the UK and US and wrote several books on training ( sounds awfully familiar). 10 things he figured out. 1. You must train. This was a novelty in as such as there where no professional athletes to look up to and people still toppled away for. 14 hours or more at work. Yet, he realized that people are getting sick and something must be done. 2. It is ok to train for looks also, not just for better health. Another radical idea, IF anyone trained it was to be a gymnast or a wrestler not to look hot at the beach. 3. Women should train not just to have a better physique but also to elevate their mindset. You have to remember this were the 1900s, women could not even go to the beach much less do sports. Women’s voting was at least 50 years away, 90 in Switzerland ( sorry cold not resits) so for someone to come out and make that statement was revolutionary. “Corsets are evil and should go away” he said. Yet in 2018 we have “influencers” telling girls to wear waist trainers which have massive implications on your health. Yes, the olden days were better. 6. Train with proper intention and tension, do not just heave ho the weight around. 7. Do not lock out ” it is much more difficult to lift weight than to hold it. I can lift ( he probably meant deadlift) 400 lbs but can hold 800lbs therefore holding does not equal proper training. 8. Know your anatomy. Sandow was self taught but he gained a very good understanding of how muscles work, figuring out agonists and antagonists and the like. 9. He followed a flexible diet meaning he ate wholesome foods most of the time but was not above having a beer ( he was German after all) or to overeat on certain occasions. 10. He was pretty much against unnecessary equipment, according to his legend he got his first job by smashing every training device in Amsterdam in order to show their uselessness. Now, I am a fan of cables and certain machines BUT the adductor machine, seated calf raise and any type of kickback machine can go. E. Use common sense and/or listen to German coaches! Previous post: WHY DO SO MANY PEOPLE FAIL IN THE GYM?